Review: A suburban couple suspect their new neighbours are spies. They soon find themselves drawn into the dangerous world of espionage. What I don’t understand with this film is how the likes of Zach Galifiankakis and Isla Fisher can subject themselves to be in something like this. They are really good actors but this is just something else. I didn’t care or believe in any of the characters. After seeing Isla Fisher in serious work like Nocturnal Animals (2016) I just can’t relate to her in this. Her role doesn’t suit her. Good quality actors but completely wasted in this film. This whole film is terrible. There have been versions of these sorts of films been done before but only better. 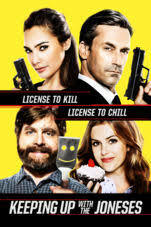 I could say that this has elements in it of Bad Neighbours (2014) and trying to hard to be like Mr and Mrs Smith (2005). I didn’t find any of the jokes funny. This is a very boring and forgettable film.